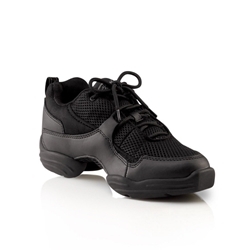 The Adult Fierce Dance Sneakers – Capezio® DS11 comes in Black, and is available in Adult Sizes 4M – 10.5M. This popular Dance Sneaker features a padded tongue, collar, and foam padding throughout to ensure comfort. Perfect for many kinds of dance, including hip hop, jazz, salsa, zumba, and more, whether used indoors or outdoors. Specifically manufactured for dance to provide easy turns and spins, and to hold up under the pressure – the Fierce is appropriately named!